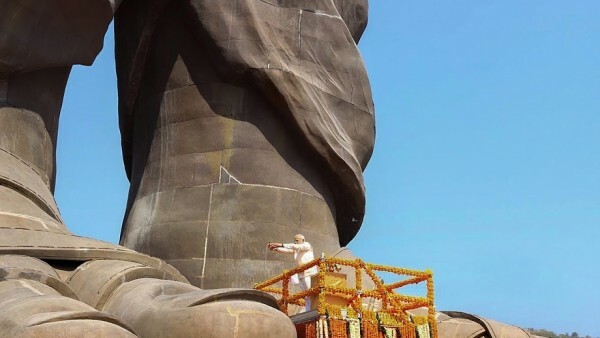 Dwarfed by tall statues: Narendra Modi. Modi is obsessed with creating history every day and if he can become the first Indian Prime Minister to visit Timbuktu he would do so whether it is necessary and impactful or not, says former Union Minister Yashwant Sinha. There is one thing he has done which no Prime Minister has done before — he has taken most of the existing government programmes and renamed them, so that the credit and glory accumulate to him, observes the former BJP leader in his book “India Unmade: How Modi Government Broke The Economy”, a devastating essay on Modi and his government in the last four and a half years. Sinha, who has been critical of the BJP-led government, has dedicated the book, published by Juggernaut Books, to “All those who are not afraid to pursue the truth” says Modi is the kind of man who wants to do everything himself. In the chapter “Hail Caesar! Modi’s Style of Functioning”, the 81-year-old bureaucrat turned politician who was Minister of Finance and External Affairs in the Vajpayee government says Modi has centralised all decision-making powers in the government of India in himself, assisted by a few chosen officers in his PMO. “However, he is known to be more interested in powerpoint presentations than in reading voluminous files. This is a pity. It means that he does not grasp the nuances that are stored in institutional memory. Perhaps it suits a man whose intellectual training lacks rigour at best (indeed, no one has seen his higher education degree in ‘entire political science’),” Sinha says in the book co-authored with journalist Aditya Sinha. He says the government of India administration is driven by three centres: one, the prime minister and his PMO; the finance minister and his ministry; and three, the Planning Commission. A politician used to head the Planning Commission earlier, but now it has been silenced and replaced by the Niti Aayog, where Modi has placed people who have zero influence on governance, Sinha says adding that leaves only two drivers of government. The veteran politician, who had quit the IAS to join politics, observes that everyone knows how the finance minister’s influence in government has declined to almost zero and he is unable to push things even in his own ministry. “After all, why his finance secretary Hasmukh Adhia was involved in the infamous demonetisation exercise, the finance minister himself was in the dark. The finance secretary’s proximity to the Prime Minister goes back to their days together in Gujarat. Modi, he says, is, unfortunately, a man who is impatient with institutions. His faith in himself blinds him to the fact that he is not a king, that he is only the head of a parliamentary party with a majority that enabled it to form a government, and which is prescribed with limits by the Constitution that has inbuilt checks and balances. Sinha says the cabinet is collectively responsible to parliament. But as an institution, it has been turned into a rubber stamp for the prime minister’s decisions. “It is said that most cabinet ministers are not allowed to speak unless an item of their ministry is up for a decision. Modi stands on a different plane from the ministers, and he has no time for them because they don’t matter. Only he does, and he will rule through bureaucrats — this appears to be his mantra,” says Sinha. The November 2016 demonetisation of high-value currency, for instance, was revealed to the cabinet only minutes before it was announced to the nation — at no stage was it discussed with the collective political brains trust of the government. He feels perhaps a wider discussion would have made it more effective in achieving any of the goals that Modi set for it again and again during that surreal winter. Sinha refers to another big decision which took the concerned minister by surprise was the BJP’s withdrawal of support to the PDP government in June this year with whom it was in a coalition government in Jammu and Kashmir.